I love old ladders, but who knew they would add so much visual impact to my wall? Once upon a time the wall looked like this. It was… okay, but a little plain. Then I wondered what it would look like if I were to hang my vintage ladder on the wall. It looked better, but still wasn’t quite there. I added a painting of Mr. CH’s family homestead. I love this painting, but it still wasn’t right. The frame was distracting me. So I pulled out my brush, used some Annie Sloan Paris Gray paint. After it dried, I sanded it down in places, then added a coat of wax. I like the combination of the white, gray, and green. Yes… perfect! Luv the frame , looks like old barn wood. Cute little green ladder. Cute! 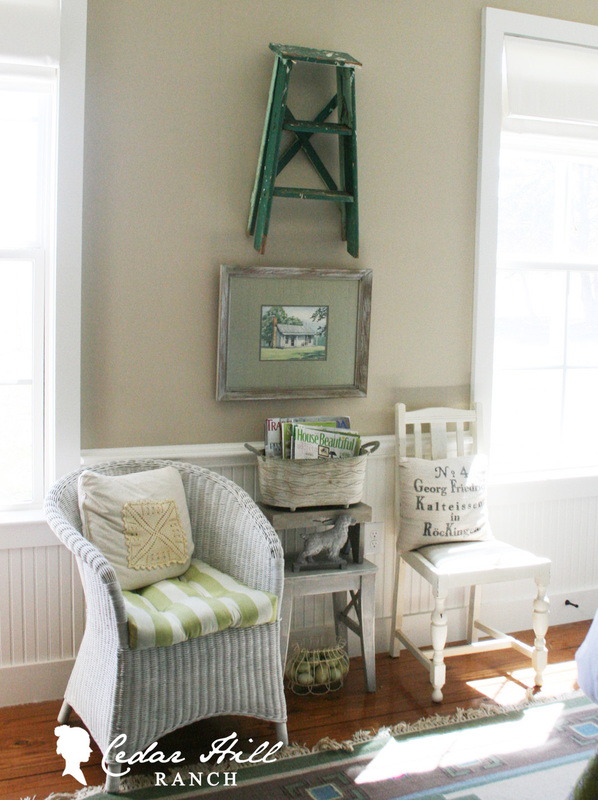 I love old ladders too – I have a large one leaning against the wall in my living room right now! This looks so cute and I like what you did with the frame. Love the pillows too! BTW, when is the new house update? Love the whole vignette and the frame is perfect. I love ladders, especially if old and rough! I’m going to use them often in my new home. I adore ladders. I had three little ones and two large ones. I just sold two of my little white ones. However I just spotted a cute shabby pink one I think I must have. I love your look! Looks great! It fills the space nicely. At least for me, too, dear friend!!! 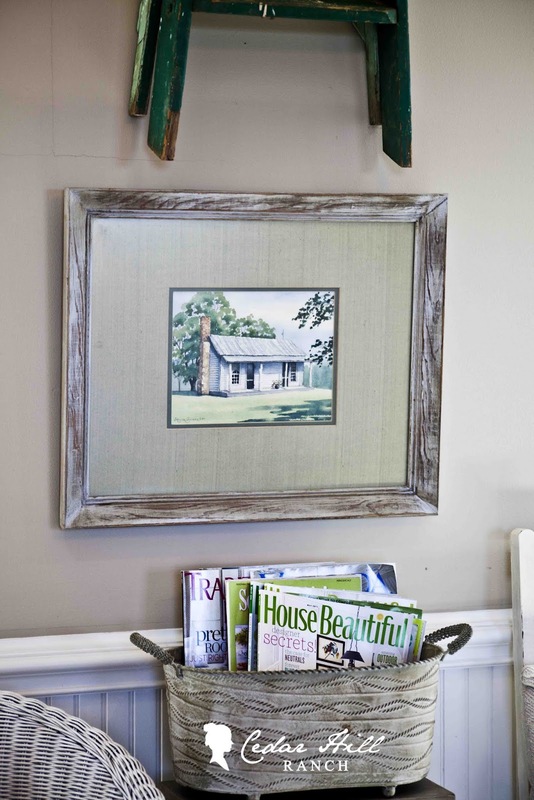 I adore how the print of the farmhouse changed with the texture of the frame!!! You put this whole vignette together for a big impact. 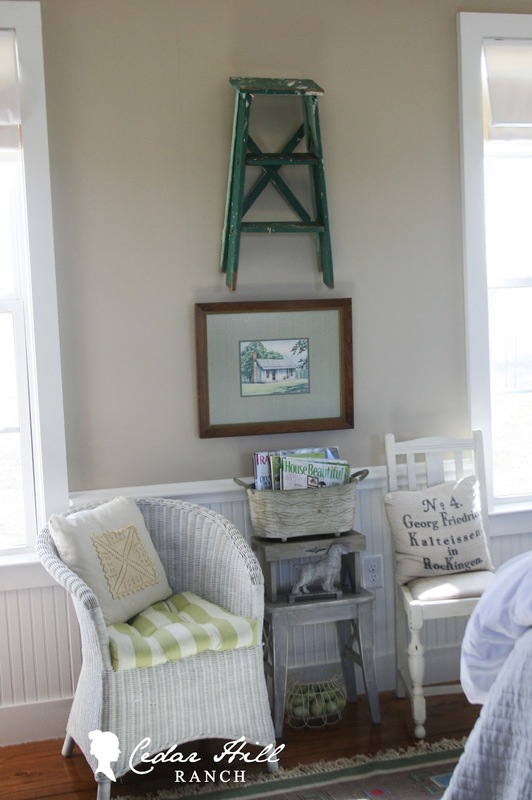 What a great idea to use a ladder as wall art! So creative, Anita! Your homestead picture is such a treasure! I love to come and visit! Now this is a wall accessory my husband could understand. Maybe. I like the ladder used as wall art. It looks perfect. I like it! It seems to fit with the house in the frame! Love your Vignette Anita! 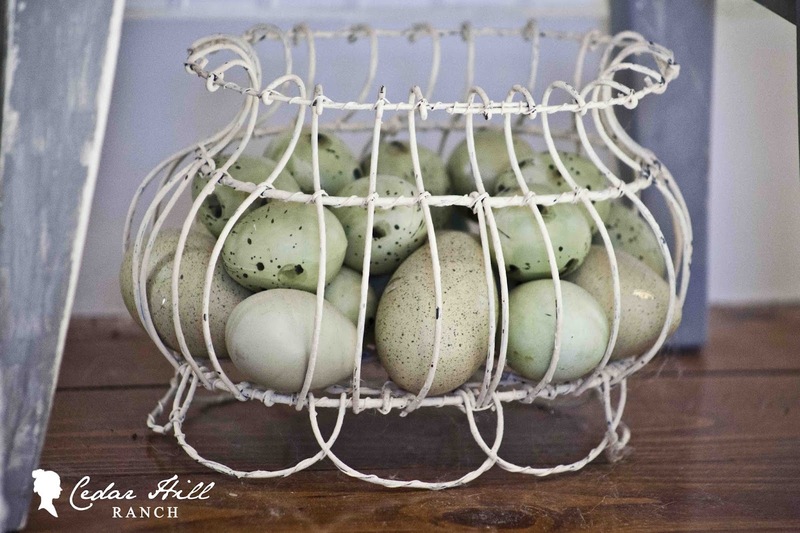 And yes I too love ladders <3 I am on the hunt for an orchard ladder! Anita, this is a perfect vignette! I love the frame! 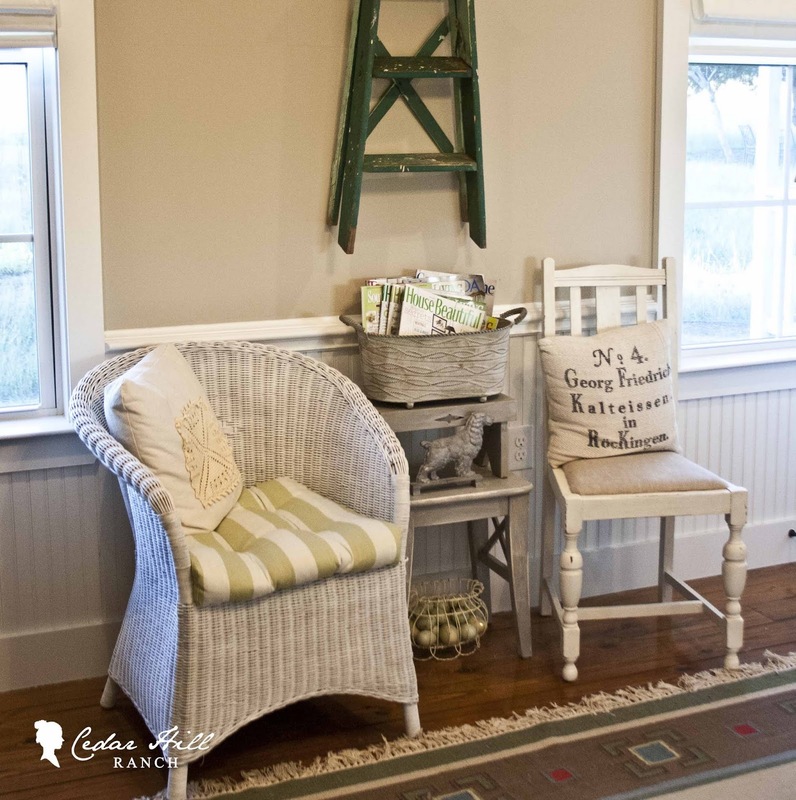 The ladder is a perfect conversation piece to this too! Looks great! I love the ladder, Anita! My dad has a similar one that I want to use as a plant stand in the sunroom. He doesn’t “get” why I would want it in the house. LOL. Anita, you made this wall and it’s accessories so perfect. Starting with that great ladder! I am like you; if something is a little “off”;like the frame I have to make a change! I’ve used ladders to hang vintage quilts, as a small side table, and to reach things up high, but never thought of using one as a piece of art. Very clever, Anita! Much better! love the frame transformation!